Happy Mother’s Day, Sara. | everything will turn out alright. I’m Travis, Sara’s husband. I’ve commandeered the blog to write a quick little guest post for Sara on Mother’s Day. I hope you will indulge my being a little sentimental. I met Sara during my sophomore year in college, and I have been hopelessly in love with her ever since. She is an amazing woman inside and out, and I consider myself truly blessed to be her husband. Those of you who know her personally will tell you that she is hysterically funny, remarkably smart, and fiercely loyal to those who are lucky to count themselves among her friends and family. Speaking as her husband, I would also want to add that she is zealously devoted to our marriage, our friendship, and our unborn little girl. Already she is proving herself to be a wonderful mother, and for this I am incredibly proud, though not a bit surprised. As Sara has reported, there have been a few scares in our pregnancy involving trips to the emergency room, and worried calls to the doctor. While we certainly know that there are many couples who have had much more difficult and disheartening pregnancies, being prematurely rushed up to labor and delivery at 3 a.m. as we have (twice) is a frightening experience that I wouldn’t wish on anyone. Despite all of this, Sara has handled everything with grace, optimism, and a selfless disinterest with anything except the well-being of our baby girl. For this I am so grateful. Sara truly inspires me, and (I hope my female friends won’t take this offensively) I find it incredibly beautiful to watch her body perform what it was designed to do. As some of you may know, I am currently waiting tables at a restaurant while I attend graduate school at Indiana University. It’s hard work, but fine dining is something that I really enjoy, and I consider myself to be pretty good at it. It gives me the opportunity to learn about food and wine, but also to interact will all kinds of people. Generally, most of my guests seem very nice and generous. However, as my peers in the industry will no doubt confirm, Mother’s Day is almost never a pleasant experience for anyone involved. This was especially true for one table in particular this morning. There were three grown children all probably close to our (Sara and my) age eating dinner with their mom and dad. When they weren’t bickering back and forth, they just sat in silence, picking disinterestedly at their food. This poor mother looked so miserable as she sat with her husband and children, none of whom acted like they wanted to be there, much less interested in honoring their mother on the one day of the year that is supposed to be about her. It made me feel so sad and I wished that I could do something to make them treat her better. I hope my bringing this up doesn’t sound like I’m being presumptuous or judgmental. Obviously, I don’t know any of them, and it’s possible that there is a complicated, sad history between everyone in the family that might explain their behavior. Still, I just hope that in another twenty years or so when Sylvie and her potential younger siblings are all grown up, they will show more interest in honoring the woman who has conceived them, worked so hard to sustain them, and endured pain and worry for them. This Mother’s Day is our first as (almost) parents. I wish I were able to do more for Sara today, but as newlyweds with school and a baby to pay for, our expendable income is pretty low. A card, a few used books for the baby and some flowers will have to do for this year. That being said, I know our love and devotion for each other will make up for whatever we lack in money. As she grows, I hope to show my little girl how much her mother loves her, and I hope that she will be compelled to honor her. On Mother’s Day, and with every other day, I want our children to be quick to laugh, slow to anger, and enthusiastically dedicated to celebrating the love of family. If I can do nothing else for my kids, or my wife, I want to do that. 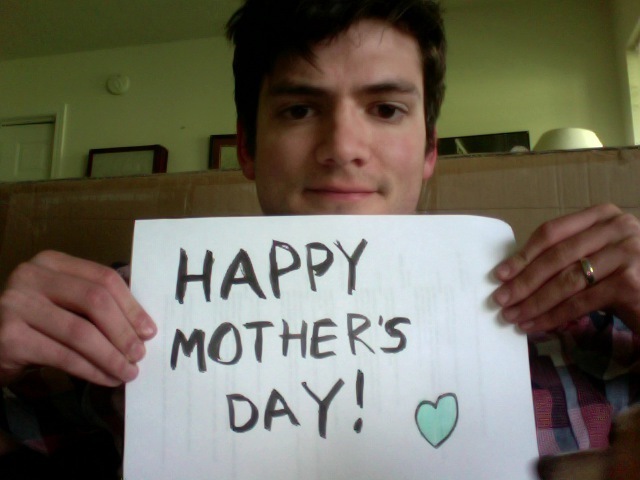 So, for all you mothers out there (and mothers-to-be! ), and to my dear wife Sara, I wish you all the best on your special day, and I would like to thank you for everything you do. You are an inspiration to us all, and you somehow manage to find ways of making us fall in love with you all over again each and every day. Thanks so much to everyone who has supported my wife by reading, commenting, and voting for her on this blog. We hope that you will continue to follow along in our incredible adventure. This is the best Mother’s Day gift ever! We are so blessed to have you in our family, and of course so proud of you and Sara and everything you accomplish every day. Much love to you all on your first Mother’s Day! Aww thanks, Meliss. We miss you, Mike, and the kids. I can’t wait to see you in just a few more weeks! It is hard to write through tears of happiness and joy. Sara has chosen an incredible person to share her life with, and I could say the same for Travis! I miss my daughter very much, but I never worry about her. I know that Travis will always care for her above all else in the world. Love to two wonderful people who will make awesome parents! Thanks, Mama. Happy Mother’s Day! ” I want our children to be quick to laugh, slow to anger, and enthusiastically dedicated to celebrating the love of family.” – My favorite part. Those are some of the same things we want for our family. Very sweet posting, Travis. We are so happy that you and Sara found each other, and proud the way that you are embracing each other and your new little Sylvie. Life will be full of expected and unexpected adventures–so your sentiment: “be quick to laugh, slow to anger, and enthusiastically dedicated to celebrating the love of family.” is what will make everything in your life richer. This is so sweet….Good job Travis! Slyvie is lucky to have two parents that obviously love each other so, so much. Happy Mother’s Day Sara! Happy Mother’s Day to you, Allie! I hope you, H, and G had a wonderful day! You both have such an incredible relationship. It fills my heart with cozy joy knowing that you have found each other and will be forever connected. As your dear friend, Sara, I must say that I am incredibly delighted for you and Travis and continue to be thrilled about Sylvie and this new amazing step in your lives!!! Aww thanks, Em! This made me a little teary eyed. We both love and miss you. You are incredible. Thanks for taking such good care of my baby sis! Sophie (your biggest fan) can’t wait to see you next month. He really is incredible. Thanks for talking yesterday. I enjoyed our conversation. We can’t wait to see you and the kiddos in a few short weeks!